AmphiZyme-P helps degrade anti-nutritional factors in diet, reduces viscosity, improves feed energy supply, improves digestibility of nutrients, improves livestock growth performance, and reduces feed cost. AmphiZyme-P helps degrade and break down the indigestible phytic acid (phytate) portion in grains and oil seeds, thereby releasing digestible phosphorus and calcium for animals. The technology behind AmphiZym-P makes the phytase granules in the product 10 times more heat-stable than all powder enzymes. This special coating technology allows Amphizyme-P to withstand the pelleting heat 10 times more than powder enzymes, which makes the effectiveness of the dose guaranteed to get better results due to excellent heat stability. AmphiZyme-P increases the utilization of phosphorus in feed, thus releasing inorganic phosphorus for direct utilization of livestock and poultry. AmphiZyme-P decreases dosage of costly inorganic phosphorus and reduces feed costs and uses a space-saving formula to ensure or improve effects of breeding. Amphizyme-P helps increase utilization of minerals, protein, and other nutrients to improve production performance of animals. Amphizyme-P decreases the excretion of phosphorus in feces, thus improving the breeding environment. 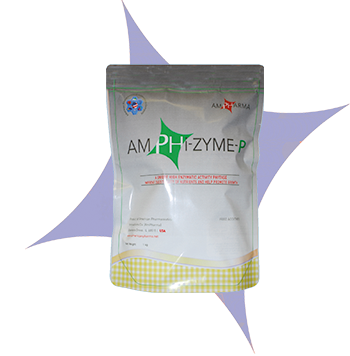 AmphiZyme-P is a high-enzyme activity phytase. It is a feed additive mainly used for animals and poultry. AmphiZyme-P helps in improving the performance of broilers, increasing the average weight and preventing digestive problems.